Continuing the success of the A200, the AirPulse is a pair of bigger active bookshelf speakers that we elaborately designed to meet the expectations from us for high-quality sound reproduction. 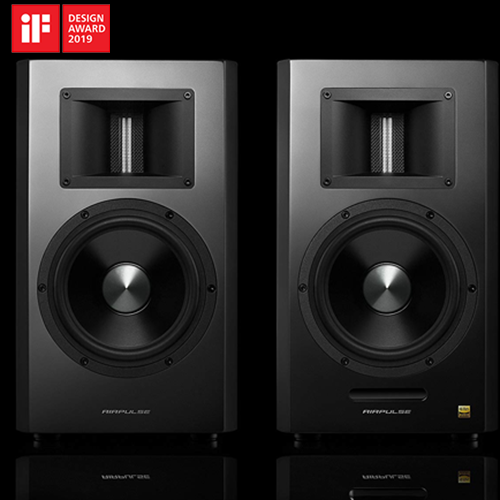 The A300 has elegant retro esthetics, combined with Phil Jones signature sound similar to what you hear from our Reference 7001 flagship monitors. 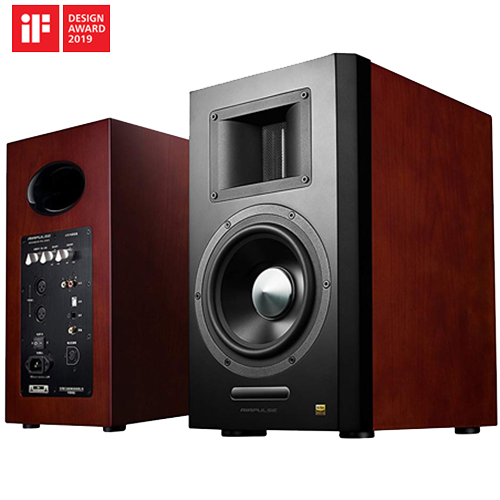 It inherits the look of its smaller brother the A200; but with larger cabinet, larger woofers and an XMOS CORE so that it has ample energy to fill a roomier living space. 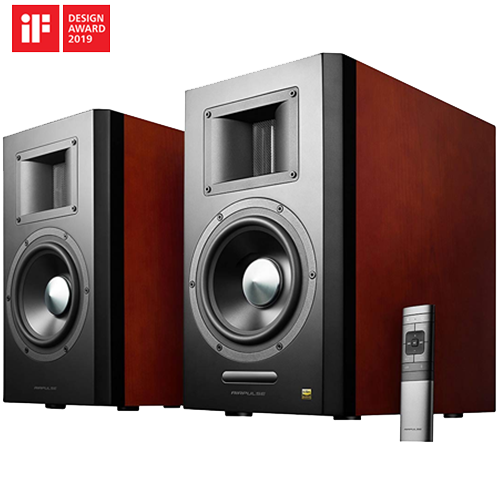 Its outstanding performance not only offers more low frequencies, but also overall higher quality musicality with the minimum signal loss from a simple to operate and hassle-free system. The A300 uses an AirPulse unique horn-loaded ribbon tweeter, proprietary 6.5-inch low distortion mid and low-frequency driver, 25mm thick high-strength MDF cabinet finished with solid wood veneer and quality furniture paint. Inside is a high-efficiency Class D amplifier with DSP based signal processing system, powered by an also high-efficiency switch mode power supply. The system has multiple input selections, i.e. professional balanced input, optical and coaxial. The USB interface of the system is based on XMOS XU216 chipset, which boasts to have up to 2000MIPS computing horsepower. The Bluetooth audio receiver in the system is built with a chipset from CSR and supports Apt-X decoder. With frequency range extended up to 40KHz, the system meets the requirement set by JAS as to bear the HI-RES Audio logo. To minimize signal loss, US made “TRANSPARENT” brand name cables are used for internal wire connections, expressing the pursuance for high-quality representation of our design team. The A300 cabinet is built from 25mm rigid MDF with cherry wood veneer finished in satin lacquer. Strong internal bracing supports and stabilizes the drivers and eliminates cabinet resonance to a minimum. To further reduce colouration, cabinet interior is fully lined with 36mm thick waved sound absorption material. Each of our cabinets is lined with a 36mm of professional-grade acoustic foam. This sound absorption material reduces unwanted resonance that occurs within the speaker cabinet leaving you with only the sound you desire to hear. The A300 horn-loaded ribbon tweeter inherits the mechanism of the tweeter in our flagship 7001 nearfield monitor. The thin aluminium ribbon diaphragm has high sensitivity, superb transient response, extended frequency range and well-defined resolution. The Mid-woofer is a powerful 6.5 inch unit with a hard anodized aluminium alloy cone suspended in a heavy duty, ultra-rigid cast magnesium alloy frame. The Proprietary Aluminum Alloy Cone (PAAC) of Mid-woofer was designed from painstaking analysis of all types of cone geometry and materials using a Klippel Laser-Doppler Interferometer. It features a huge Underhung motor structure with a high gauss Neodymium magnet and a 50mm diameter edge-wound copper clad aluminium ribbon voice coil to gain maximum linear excursion and control. This structure also reduces the weight of the driver allowing the speaker to have a very fast transient response as well as total loss-modulation distortion. The larger voice coils have less power compression because they run at a cooler operating temperature. Sonically, this means a more realistic and dynamic representation of the music. Its dynamics in music that gives it emotion and exhilaration. Cooler running temperature of the voice coil also has the side benefit of a more reliable loudspeaker, since cooler voice coil means much less chance of speaker failure. 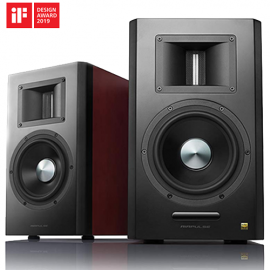 For optimum performance without compromise, the A300 woofer uses a hyper-rigid cast-magnesium alloy frame. Its increased rigidity greatly reduces speaker colouration, and its material helps to dissipate heat efficiently from the voice coil much faster than a typical steel speaker frame, which all in combination leads to increased dynamics and power handling and ultimately a much more satisfying musical experience. The entire digital system is built on a multi-core signal processor XMOS XU216, a 16-core powerful audio processor based on XMOS xCore200 architect, which boasts to have up to 2000MIPS processing horsepower. With its unique parallel structure, it is perfectly made for a timing-sensitive signal process like audio, especially audio with a high sample rate. The dual clock structure at the output stage effectively avoids signal modification between different sample rates, and can further reduce signal distortion. The power amplification part is built with 3 pieces of TAS5754 Class-D amplifier from Texas Instrument. This component is one of a handful of Class-D amplifiers in the market which combines high input sample rate support and high output PWM carrier frequency. These two characters are essential to achieving low background noise and low distortion. The up-to 192 kHz Input sample rate support guarantees the entire link of digital processing run without any change of sample rate of the signal. Its 768 KHz output PWM carrier frequency, twice to 384KHz of traditional Class-D amplifier, is even more suitable to drive the high sensitivity ribbon tweeter. 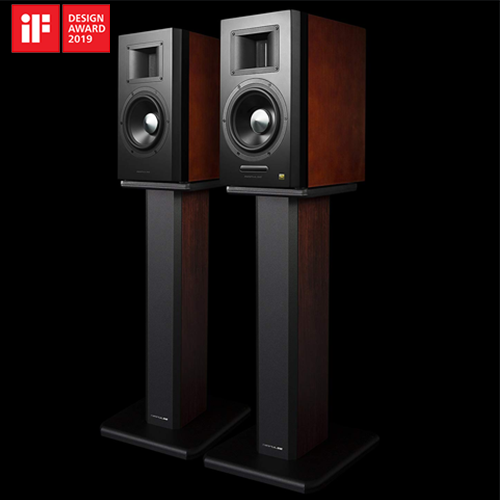 Each of the left and right channel mid-low range speaker Is driven dedicatedly by one TAS5754 connected in parallel bridge mode. The third TAS5754 is connected in bridge mode for left and right channel ribbon tweeters. The analogue front end uses top-of-the-line components from Texas Instrument. With the special configuration, the chipset work at 96 KHz which offers a frequency response up to 40KHz. The wide range input frequency response guarantees thorough signal acquisition at very low distortion. To avoid cross-talk between the two analogue ports, A300 uses relay Instead of a semiconductor switch. The SPDIF receiver is PCM9211 also from Texas Instrument, which supports up to 216 kHz input sample rate. With a very low output jitter, the unpacked audio signal can be delivered to XMOS processor with zero loss. The USB audio interface supports UAC2 audio application. A300’s USB interface supports an input sample rate up to 192 KHz. This audio application effectively avoids signal degradation and dynamic range loss due to the PC audio DAC and provides a new way of high definition audio playback. The Bluetooth audio receiver is built on Qualcomm’s Bluetooth V4.1 chipset, which supports APT-X decoder, and offers a far better audio playback quality than traditional Bluetooth which runs on SBC. The A300 uses TRANSPARENT audiophile grade speaker cable made in the US for internal wiring. Signals are transferred with utmost accuracy and minimum loss. With it, you are brought steps closer to music! The A300 comes with a wireless remote control used for taking control of your sound. You can switch between inputs easily from the comfort of your seat. Input Mode: AUX, Balance Input, USB, Optical, Coaxial, Bluetooth.